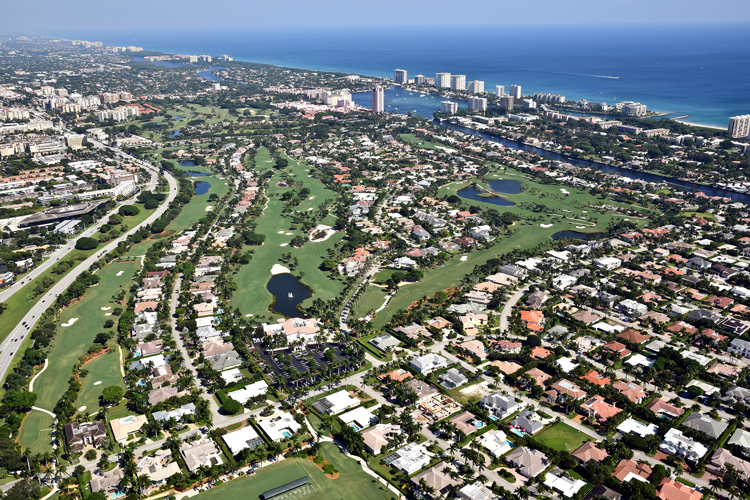 South Florida is a region known all across the globe for its impeccable golf courses. Members of local country clubs bask in the exclusivity of these private courses, and enjoy the various member-only amenities, including restaurants, spas, fitness centers and event spaces. The leisurely lifestyle of South Florida residents means there is no shortage of country clubs and private golf courses in the area. Furthermore, the pleasant tropical weather of the region creates a pristine atmosphere for this popular sport. Beautiful views, bright green fairways, well-designed layouts, and lush landscaping make these some of the best private golf courses in the area. Royal Palm Yacht & Country Club is one of South Florida’s premier private clubs, offering members a wide range of activities within their state-of-the-art facilities in Boca Raton. To increase the club’s exclusivity and desirable nature, members may only join Royal Palm by invitation. Their beautiful course was originally designed in 1959 by Robert Trent Jones, Sr., and has since been updated by legendary golf course designers Joe Lee and Jack Nicklaus. Not one detail was overlooked within this prestigious 18-hole course dotted with stunning water features and lush foliage. The club’s emphasis on and care for their golf courses is evident, as they are the only private club in the county that offers 36 holes of manicured championship golf. Members enjoy the sport in a forested park-like setting, as the fairways are lined with stately indigenous trees and colorful flowers. With their two full and well-maintained courses, competitive tournament schedule, and popular ladies golfing program, Fort Lauderdale Country Club is one of the most desirable golf courses in the South Florida region. Boca West Country Club is the nation’s largest private equity owned clubs, and its golf courses certainly match its prestige. Throughout Boca West’s 54 distinct villages lies four 18-hole championship courses designed by some of the best golf course architects of our time: Pete Dye, Arnold Palmer and Jim Fazio. At Boca West, you will discover strategically placed bunkers, rolling fairways winding through the natural Florida landscape, and putting greens that test your touch. Members enjoy a four-acre short game area, a driving range with 50 tees, individual golf pro shops, and a restaurant. The Moorings Yacht & Country Club in Vero Beach is a private member-owned club offering a wide variety of sports and social amenities in an elegant, relaxed and welcoming environment. Golfers, yachters and socialites flock to The Moorings for the luxurious lifestyle awaiting. The championship Hawk’s Nest Course was designed in 1987 by Jim Fazio, and is one of the few “green courses” left in Florida, as it boasts tall pine and oak trees to maintain the natural look of the property. The Moorings Course was designed by Pete Dye in 1974, and is often called his “Little Gem”. It is one of the more breathtaking courses to behold, as the entire front nine holes are surrounded by water. 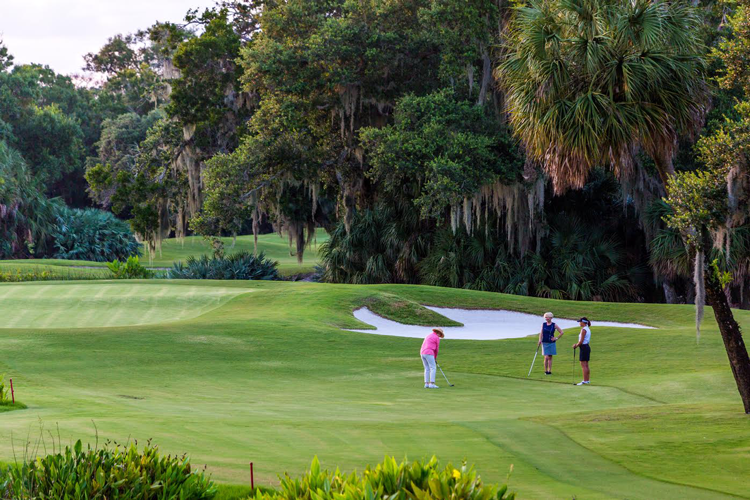 Furthermore, the back nine feature majestic oak trees and offer an awe-inspiring view of the Indian River Lagoon. The Seagate Country Club in Delray Beach features one of the finest golf courses in the region, crafted especially for those who are up for a more challenging game. The course was originally designed in 1973 by noteworthy golf architect, Joe Lee, and was recently restored with advanced technology that maintained the true spirit of the original design. This 18-hole championship-style golf course stretches across 300 acres, winding through bass ponds and other natural features teeming with wildlife. Members love the new state-of-the-art practice facility featuring a fully outfitted driving range, putting green, short game pitching, and a staff of PGA professionals on site.